It is common knowledge by now that menswear has fully embraced pattern, colour and texture as the modern man continues to gain confidence and become more sartorially adventurous with his personal style. There will always be a place for block-colours and muted tones in menswear, but pattern and print is fast becoming an essential part of any contemporary wardrobe, and the pattern of the AW13 season is undoubtedly checks. It is likely that the majority of our readers will already own a checked shirt or two – but this autumn/winter the pattern is being applied to nearly every garment imaginable, whether in gingham, plaid, tartan or Prince of Wales check form. The current trend caters for everybody: smaller checks in muted tones are available for those who prefer a subtle and refined approach, whilst louder, oversized checks are on offer for those who tend to be a bit more sartorially audacious. Several high fashion designers backed the checked trend fully at the global AW13 fashion week previews. 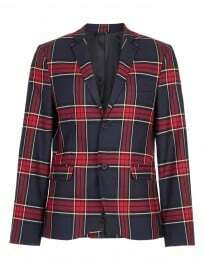 My personal favourite was the collection by Moncler Gamme Bleu, which demonstrated a clear Scottish influence from the outset with tartan checks applied to a plethora of pieces that included kilts, capes, jackets, trousers, coats and vests, along with accessories such as hats, scarves, socks and shoes. Many of the looks also featured a Scottish heritage sporran in the same tartan pattern. The set of the showcase was particularly dramatic, with pretend snow and barren, leafless trees creating a harsh yet beautifully wintry vibe. The initial colour palette of blue, grey and white reinforced this outdoors aesthetic perfectly, echoing the frosty feel of the backdrop. Another collection showing a distinctly Scottish influence came from E.Tautz. Described on Style.com as one of the fashion house’s “most fashion-forward collections to date”, they set about making traditional Scottish tartan appear more contemporary – and the collection certainly achieved this. E.Tautz cleverly made use of exaggerated, oversized tartan, applying the pattern to overcoats in subtle monochrome palettes and pairing with stylish hats for a more refined, pared-down and altogether wearable look. Subtle, grid-like checks followed, which were again applied to overcoats for a less in-your-face effect. However, not wanting to be outdone by some of the more experimental, bolder collections, the show ended on a punchier note with this season’s go-to hue, orange, injected into check suiting via an effective pairing of soft grey and bright orange. Of course, there are always collections which tend to go a bit too far – and in my humble opinion the collection by James Long was the most controversial. Unfortunately, the colour palette was quite drab and dreary, the use of patent fabrics didn’t sit well with the traditionally matte and textured approach of the winter season and the cut of the garments was slightly too oversized. The fashion press has been championing the checked pattern revival in menswear. Details stated that: “Traditional plaids, checks, and houndstooth are once again indispensable in a modern man’s wardrobe”, whilst GQ have published a guide to the best checked shirts available and also backed bold check suits as a key piece for autumn/winter 2013. Similarly, Shortlist recently included a feature on the relaunch of Jigsaw’s menswear line, their first since 1999. The key lookbook image features a checked mac paired with micro Prince of Wales check trousers, showing that the new Jigsaw collection has its finger firmly on the pattern pulse. Even the Telegraph recently featured an article on the Marks & Spencer ‘Best of British’ collection, which features an array of tailored pieces, blazers and trousers in fetching heritage check prints and patterns. Checked patterns are huge within the current menswear market. From high street shops such as Topman and Burton to online superstore ASOS to premium retailers like Mr Porter and Oki-ni, there is a checked piece to suit all budgets and personal styles. The great thing about this trend is its versatility: you can add a subtle, muted check to an outfit for a welcome touch of detailing, or go all out in head-to-toe, oversized checks in bold, brash colours – there really is something for everyone. The good news is that based on the SS14 previews, major design houses such as Brioni and Giorgio Armani have backed the check for 2014 as well, meaning the pattern looks here to stay for the long haul.